Could albatrosses wearing trackers be a weapon against illegal fishing? This article from Hakai Magazine looks at novel new research to tackle a global issue. Weimerskirch and his team developed a GPS logger that detects the radar emissions from nearby ships. The logger records the positions of the birds and the boats, giving the researchers a cunning way to track the ships’ movements. In field trials conducted on the Crozet Islands, the researchers fitted 53 birds with the lightweight devices. When the birds return to nest, the researchers recover the loggers and the data. Though they were only able to recover data from 43, the observations showed a high correlation between the movements of birds and fishing vessels. To confirm the accuracy of their devices, the researchers worked with the French longline fishing industry to compare their data against the fishing boats’ Vessel Monitoring System (VMS) radar detections. In their trials, the birds’ loggers accurately detected all the boats’ VMS signals, as well as one anonymous—and possibly illegal—vessel. The researchers are now working with the French military to help patrol near Crozet for illegal fishing. “The idea is to send the information as soon as the logger gets it, and relay that to authorities,” says Weimerskirch. The risk of the birds’ cover being blown is minimal, Weimerskirch says. 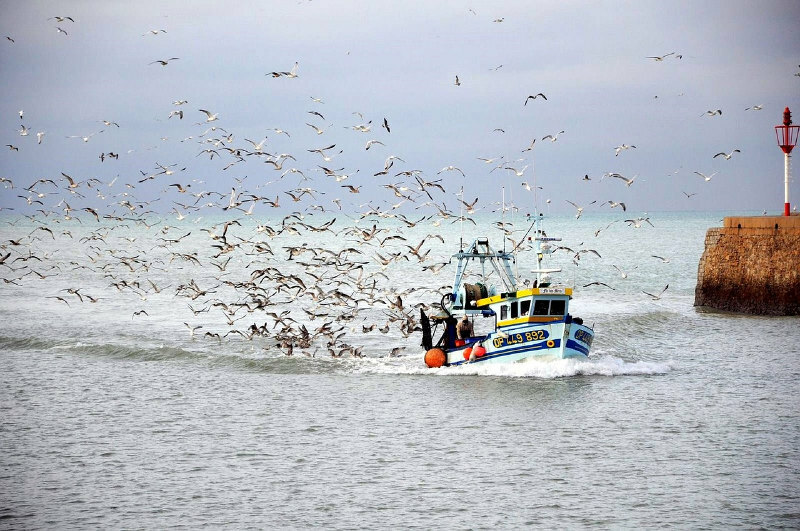 There are many birds flying near fishing boats, and the devices are small and discreet. Weimerskirch says the next generation of their device is already undergoing testing. Crucially, the upgraded trackers will return data in real time. This will improve the value of the data they provide, since researchers will no longer need to wait until the birds return to their nests to recover the loggers. The new devices are also smaller, so birds more compact than the sizable albatross could be pulled into service. This isn’t the first time animals have been used for covert operations. In the United States, the navy has trained dolphins and sea lions to find mines and swimmers in off-limits waters. The Central Intelligence Agency reportedly spent years training ravens and other animals to spy for them. Next year, Weimerskirch and his team will begin working with the government of Ecuador to combat its own problems with illegal, unreported, and unregulated fishing. “We will apply our method to other species of albatross and boobies in the Galapagos, because there is a very strong illegal fishing industry operating all around the islands,” he says. New Zealand will also start work with the team next year—though with a slightly different aim. The government wants to know if the serious declines in some albatross populations is being caused by fishing ships operating in the birds’ foraging grounds. In the future, the large-scale use of animal-borne loggers is possible, Weimerskirch says, as is expanding the use of the device to other marine animals such as turtles and seals—turning the ocean’s denizens into a network of spies. This article Turning Birds into Spies Against Illegal Fishing was originally published at Hakai Magazine on 09/04/18.